A few months ago I finished a quilt I had been working on for well over a year. When I finished it, I put it away for several months and could not bring myself to photograph, much less write about, the quilt. I normally take photos within a few days of finishing a quilt and rush to blog all my thoughts. Now, to the quilt, I loved how it turned out. I am so grateful to have an artistic outlet to process my thoughts and emotions, to pray, to listen, and to see beauty. I am so grateful for sewing and how it was a constant through this year. I have several other projects that came out of this time of pain, but this will be the first one for me to share. Hopefully, with each post, I can speak more about how God spoke to me and carried me through this time. 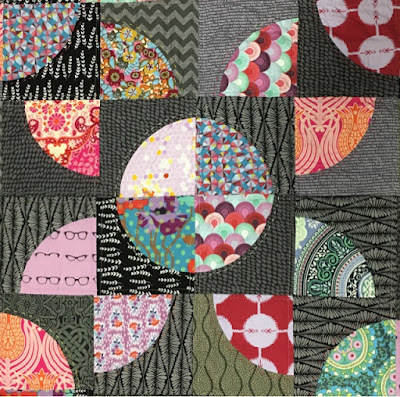 The quilt pattern is a variation of the Drunkard's Path quilt block. The finished quilt is a throw size (or picnic size) at 70 inches wide by 90 inches long. Here is the back, pieced from some of my favorite prints. The lines on the quilt were machine quilted and the circles were hand quilted with perle cotton. Here is a close up of one of the blocks. Some of the words on the darker gray fabric are: "Be Unstoppable *Laugh Loud * Be Grateful * Take Chances * Smile Often * Let Go * Have Hope * Love Deeply" These words are so perfect for this quilt! Cheers to 2017!!! How was your 2016? Do you like the quilt? What have you been working on? How do you "cope" through pressing or traumatic times? What a perfect way for you to end this year! I love it and know you put your heart into it.